On April 19, 1944 our crew was assigned to a new B-17G, aircraft no. 4297678. Our pilot, 2nd Lt. Walter W. Smith, named and painted the name on the nose. He named it after his wife, Jewell, and hometown Birmingham, Alabama. So from then on it was known as the Birmingham Jewell. It was my fifteenth mission. The crew included Lt. Smith, Pilot; 2nd Lt. Ralph J. Brocato, Copilot; 2nd Lt. Raymond W. Connor, Bombardier; T/Sgt. Joseph Diorio, Nose Gunner; S/Sgt. Alvin J. Anderson, Flight Engineer/Top Turret Gunner; S/Sgt. Oval Greenmyer, Radio Operator/Gunner; S/Sgt. John J. Bodnar, Ball Turret Gunner; S/Sgt. John J. Falbo, Right Waist Gunner; S/Sgt. Leonard W. Leedy, Left Waist Gunner; S/Sgt. Joseph L. Prevost, Tail Gunner. The target that day was Kassel/Waldau and Eschwege, Germany to bomb aircraft assembly plants. My thirtieth and last mission that I flew in The Jewell was on June 10, 1944, to Vannes, France to bomb an air-drome. The Jewell was a great B-17. It was an easy plane to fly and very dependable. She flew her one-hundredth mission on November 10th, 1944. The target was an airdrome at Ostheim, Germany. On February 3, 1945 she flew her one hundred and twenty-eighth mission, which was her last. The target was railroad marshalling yards near Berlin. Upon losing an engine near Berlin the plane had to drop out of formation and try to get back to England on its own. Three German ME-109s shot her down. Four of the nine crew members were killed. At this time The Jewell had flown more missions than any other B-17 in the Eighth Air Force. Later there were others that surpassed this number. Aboard the ill-fated plane were 1st. Lt. William A. Webber, Pilot, KIA; 2nd Lt. James T. Kiester, Copilot, MIA; 2nd Lt. Thomas A. Pickett, Navigator, POW; S/Sgt. Raymond Wetherbee, Nose Gunner, KIA; T/Sgt. Carl E. McHenry, Radio Operator/Gunner, KIA; T/Sgt. Harold F. Francis, Flight Engineer/Top Turret Gunner, MIA; S/Sgt. William T. Walls, Ball Turret Gunner, KIA; S/Sgt. William W. Scarffe, Waist Gunner, POW; Sgt. Bennett D. Howell, Tail Gunner, POW. The 379th BG (H) B-17G, OL' GAPPY, assigned to the 524th Squadron is credited with flying 157 combat missions, more than any other heavy bomber in the 8th Air Force. Historian Roger Freeman reports it in the book, THE MIGHTY EIGHTH. 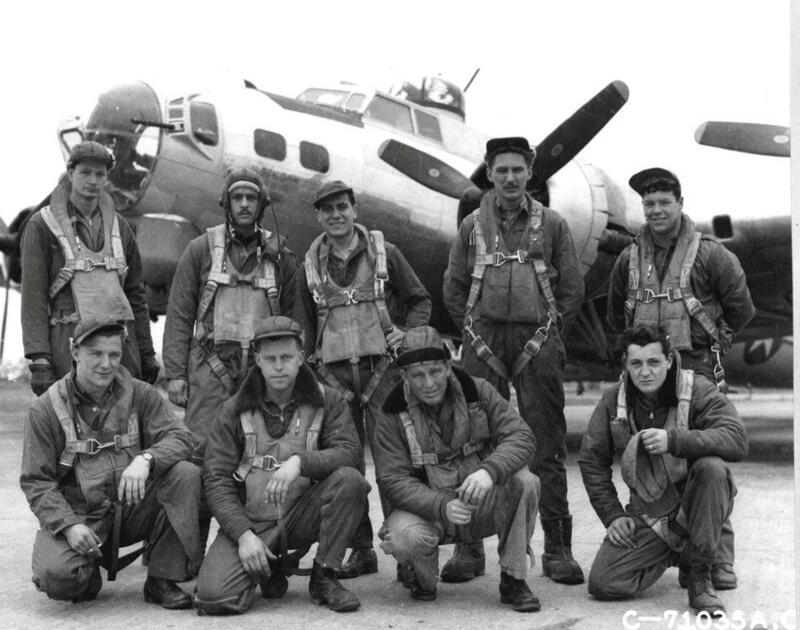 To make an understatement, the success of the "career" of the B-17s flying combat was dependent on the ground crews and specialists who maintained them. This included crew chiefs and the men who worked on them on the flight line. Then there were specialists who were assigned to the service squadron or service group and worked in the shops. Major repairs were made there on badly shot-up fuselages, wings and tail assemblies; engines were overhauled; instruments, radios, propellers were refurbished, to name some of the specialty work done by ground personnel to "Keep 'em flying!" Whatever happened to the Beautiful Birds over enemy territory where the lurking Luftwaffe roamed and pockets of flak cluttered the blue sky, both potentially dangerous, was beyond the control of the dedicated ground personnel whose work on the Flying Fortresses enabled them to soar into "The Wild Blue Yonder."